A golfer needs to take into careful consideration how he positions his feet relative to the ball in relation to the shot at hand. Indeed, while the stance is critical to where the ball will travel and the type of flight path it will follow, the actual position of the clubface at impact is the most important factor as far as initial ball direction is concerned. There are three ways a clubface can be positioned in relation to the ball (square, closed, open) and the consequences of each is explained below. At address, a club placed on the ground in a square position is one where the line of the clubface is perpendicular to the target line. Indeed, a square clubface does not lean one way or the other and instead faces the target directly. 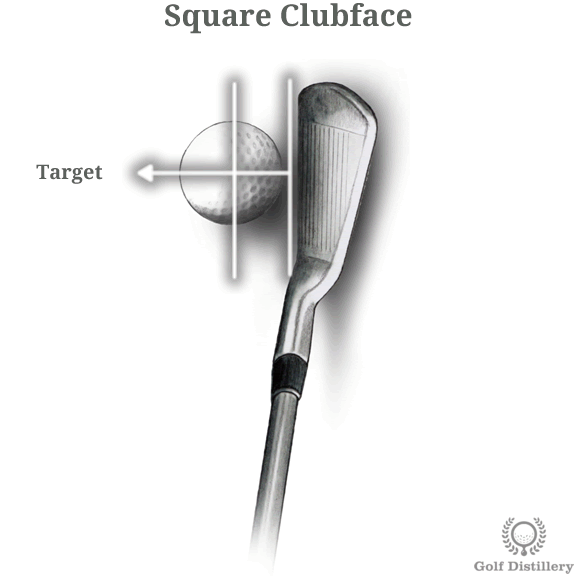 The square clubface setup is the default position for most shots. 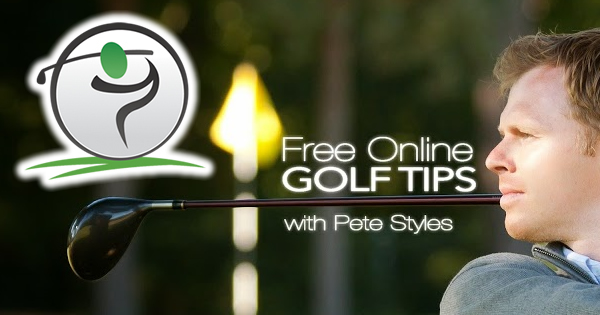 In order to set up for one, you simply grip your club as you normally would and ground it behind the ball. With your hands relaxed yet still holding on to the club, the clubface should not tend to veer one way or the other but should keep facing forward directly. As we know from the new golf ball flight rules, the way the clubface is positioned at impact will be the greatest factor in determining the direction the ball will initially travel. As a result, a square clubface at impact will send the ball straight forward, at least initially. Because it will inflict minimal side spin on its own, a square clubface will promote a straight ball flight. At address, an open clubface is one where the line of the face of the club points to the right of the target line (for right handed golfers). This is contrast to a square clubface which faces directly straight ahead. Oftentimes, golfers proceed with setting up for a clubface adjustment incorrectly, leaving them no chance to produce a shot that matches their intentions. 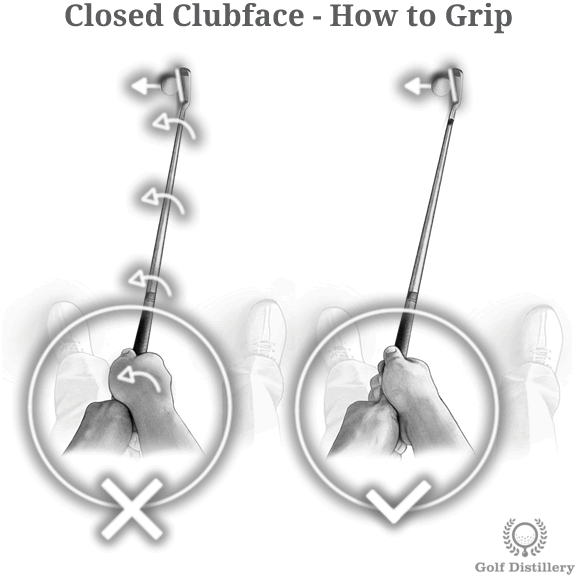 The mistake they do is that they grip the club normally – like they always do – and adjust the face of the club through a rotation of their hands while the club is on the ground at address. 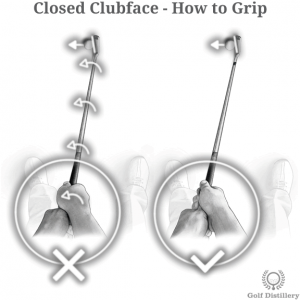 So in this case, they would grip the club with a square face and open the face at address by rotating their hands clockwise. Using this process, the clubface modification is performed solely through a change in grip strength and the problem lies in that the grip strength will automatically be reverted to its usual self by the time the club reaches the ball at impact. 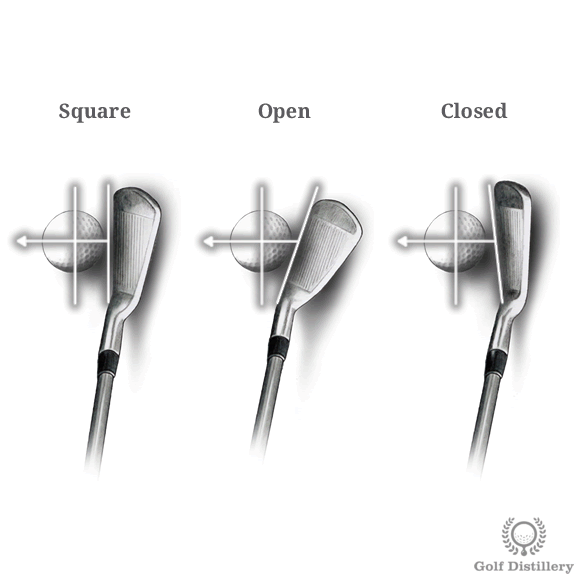 So while you think you are setting up for an open face at address, by the time the club hits the ball the face will be back to its square position. 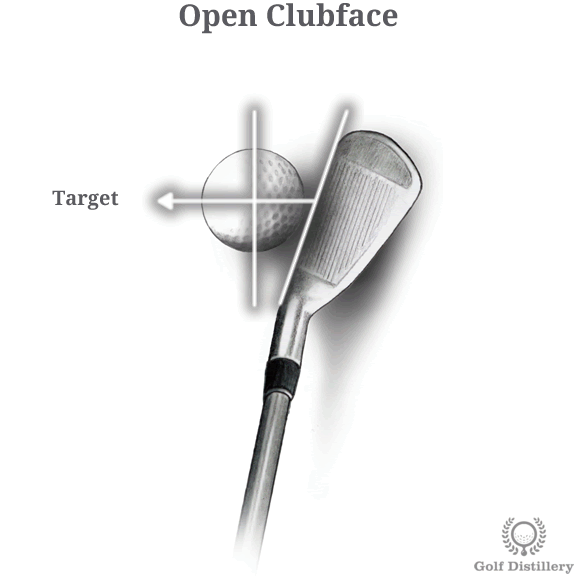 The correct way to set up for an open clubface is to grasp the club while the face already shows an open position. You know you did it correctly if your grip strength is the same at address as it normally is for a square clubface. By pointing to the right of the target, an open face will direct the ball towards the right of the target, at least initially. 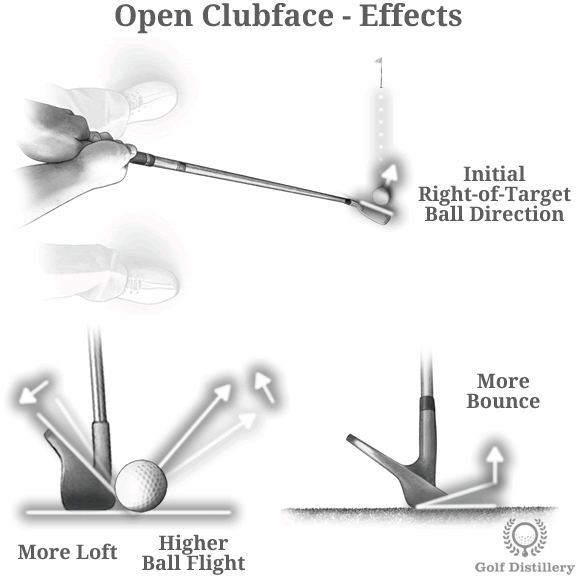 That’s because the face of the club has the most impact on where the ball will be sent initially. 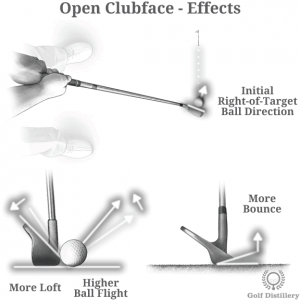 Another effect of opening the clubface is that it increases the loft of the club, which should send the ball on a higher ball flight than what that club normally would. Finally, opening a clubface gives more prominence to the bounce of the club, which should lead a club with bounce to shoot up from the ground – or sand – rather than dig through it. At address, a closed clubface is one where the line of the face of the club is pointing towards the left of the target line (for right handed golfers). This is in contrast to a square clubface which sees the club pointing directly at the target or an open clubface which sees it pointing to the right. As is the case for other clubface adjustments, golfers run the risk of setting up incorrectly and oftentimes do so without even realizing the mistakes that they are making. Indeed, if one isn’t careful he’ll grip his club normally by grasping it like he usually does and in doing will have no chance of producing the shot he intends to hit. 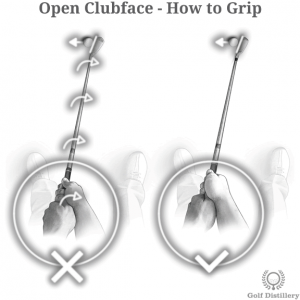 Only after putting his hands on the grip in its usual strength will he make the adjustments to the clubface which in this case he will rotate his wrists counter-clockwise so that the club will face left of the target and will feature a weaker grip. 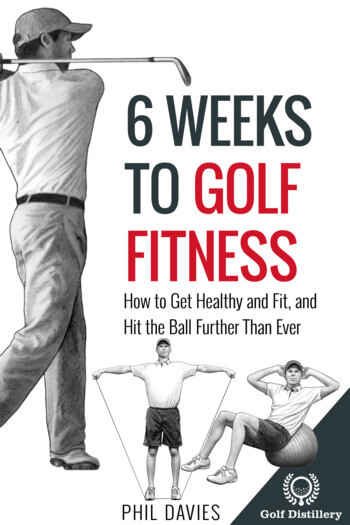 What will happen then is that during the course of his swing his hands will revert back to their original grip strength and in the process will cancel out the last minute adjustments for a closed clubface. The correct way to set up for a closed clubface is to grasp the club while the clubface is already pointing in the direction. 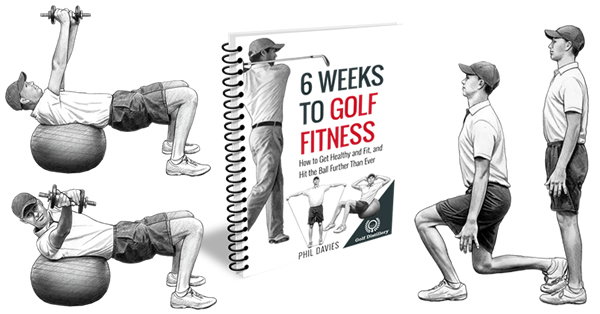 This way, your usual grip strength will be maintained and crucially will not alter during the course of the swing. The first consequence to adopting a closed face is that the initial direction of the ball will be towards the left of the target line. 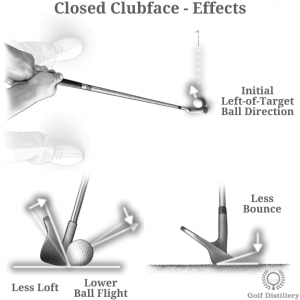 Indeed, according to the new laws of ball flight, the angle of the club will impact the initial direction of the club the most. Another effect of the clubface adjustment is that it will reduce the loft of the club, essentially limiting how high the ball can go, or at least sending it on a lower ball flight than the club normally allows. Finally, a closed clubface will restrict the bounce of the club – if any – from impacting the shot. This in turn will produce a penetrating shot and one that will dig into sand rather than bounce off of it.